Fall is my FAVORITE time of the year! I love when it starts getting cooler (DO NOT like when it gets COLD though!) and I LOVE the beautiful colors! And speaking of the beautiful colors of autumn that is exactly what the theme of the challenge is for the SUO challenge this time – Favorite Fall Colors! 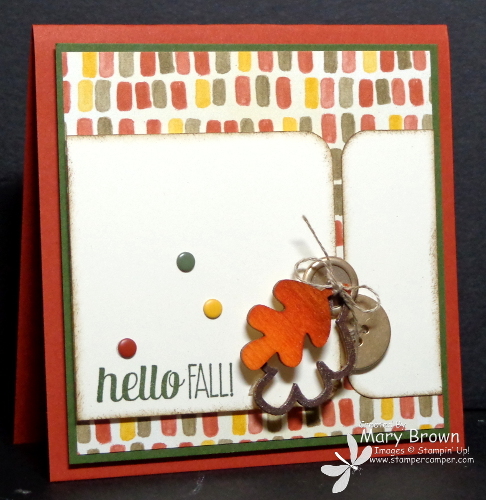 The Color Me Autumn dsp made it SOOO easy! I was looking around for a cool sketch to use and found this one over at retrosketches challenge and it just kept saying ‘use me…use me…use me…’ So I did! LOL!!! Very Vanilla – one 2 5/8 x 2 5/8 and the other 1 x 2 5/8. Round corners on one side, sponge using Soft Suede. Add the 1 x 2 5/8″ strip to right side. Add Linen Thread to the largest Gold Basic Metal Button and add to card front. Stamp greeting on the 2 5/8 x 2 5/8 piece using Mossy Meadow. Add to card front using dimensionals. Press open Autumn Wood Elements leaf in Versamark and emboss using Early Espresso Embossing Powder. Color solid wood elements leaf using Pumpkin Pie Blendabilities. Glue the two pieces together and tie to a Gold Basic Metal Button using Linen Thread. Add to card front. Add Cajun Craze, Always Artichoke and Crushed Curry Candy Dots to finish it off. This entry was posted in Holiday Mini, SUO Challenge and tagged For All Things. Bookmark the permalink. Very cute! I love the stamp set!